To ensure that you retire in good health for your retirement, the most important factors, begin to make plans. This means that a proper diet and exercise program should be a part of your daily life starting now. 1. Talk to your doctor to determine the best diet and exercise program that is right for you. While you may want to move to a city that has an abundance of outdoor activities, it is important to begin a fitness program beforehand so that you will be physically ready when you move to your new destination. 2. 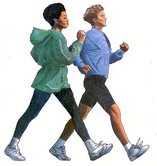 There are many exercise programs available that do not require gym membership. Begin slowly by starting with Yoga exercises. Check out Qi Gong and other meditative exercises to increase your motivation and well-being. Once you are settled in your new home, ask a neighbor if there are any programs or classes that you can join in your area. Walk as often as possible. 3. Find a partner with whom you can exercise during the week. This will be of great help in continuing your exercise program. As you make new friends, ask if they belong to a health club or need an exercise partner. Remember, it’s much more fun than exercising alone. 4. Utilize a diet regimen that is filled with leafy green vegetables, fruits, fish (at least twice a week), and whole grains. Print out recipes and take them with you so that you can readily prepare these delicious foods at home. Visit the local farmer’s market and buy all fresh fruits and vegetables. You may even obtain some great recipes there as well. 5. Reduce stress as much as possible. Remember, this is your time to enjoy all the things you’ve dreamed of doing. Moving is a stressful venture, but you can reduce the anxiety by preparing well ahead of time. If you have a friend or family member who also lives in the city you are retiring to, ask them to give you hand with the details.